Before Teddy came along, I was rather happy at home all by myself. I'd write in the mornings, read through cookbooks in the afternoon, grocery shop for the ingredients I needed, call my mom or brother while cooking, and then spend the rest of the evening with Matt. Sure, I'd occasionally meet up with friends for a hike or yoga class or lunch, but for the most part, I was on my own and very OK with that. And for the first few months of Teddy's life, except for the visits from my out of town family members, I continued on this pleasantly quiet loner path. But then suddenly, about two months into motherhood, I started to feel pretty lonely (which I understand is a little ironic given that I was no longer alone). 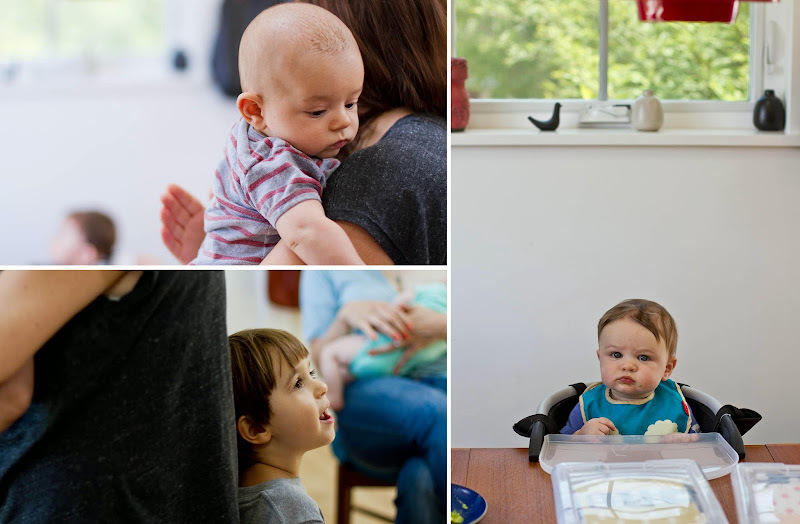 Enter Mommune, my weekly hangout with other new moms! Its roots begin with my friend Rachel, who had a baby boy last October and who works from home one day a week. Then, my pal, who runs this really cool card company had a little boy a couple of months after that. Teddy was born in January. Then, my friend Peggy had a little boy two months later, which was quickly followed up just three weeks later by Bon Appétempt-regular, Jodi, who, yes, also had a boy. So, in short, between moms working from home and moms still on maternity leave, the five of us and our five sons have managed to get together pretty consistently for the past two months, and honestly, it's kind of been a lifesaver for me. Not only is it fun to meet up with friends in the middle of the week and talk shop on the ins and outs of baby-rearing, but it's also a great place to grab lunch. Last week it was my turn to host. It was also the week The Year in Food's book came out, so of course, I would be cooking something from that. 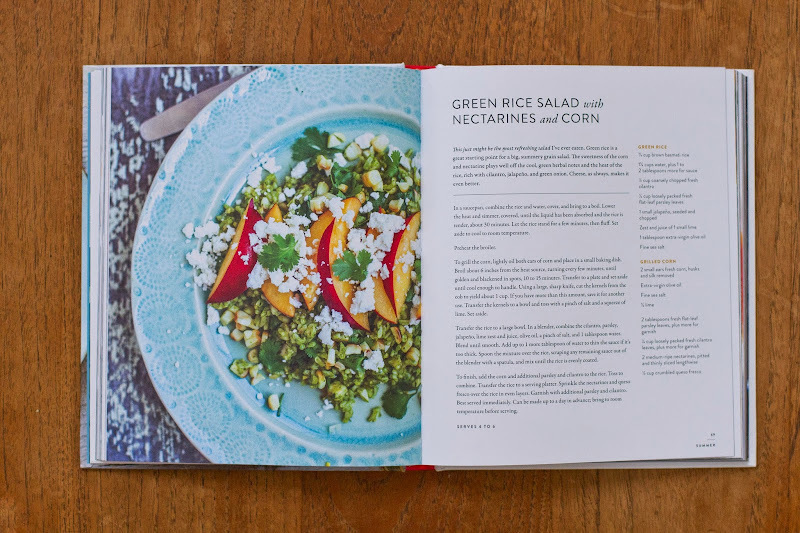 There are so many things I want to make from this book, but for Mommune, which meets around lunchtime, this grain salad seemed perfect. First of all, I love a grain-based salad. Secondly, I loved the idea of making a dressing out of a bunch of cilantro, parsley, and a jalapeño (or two). 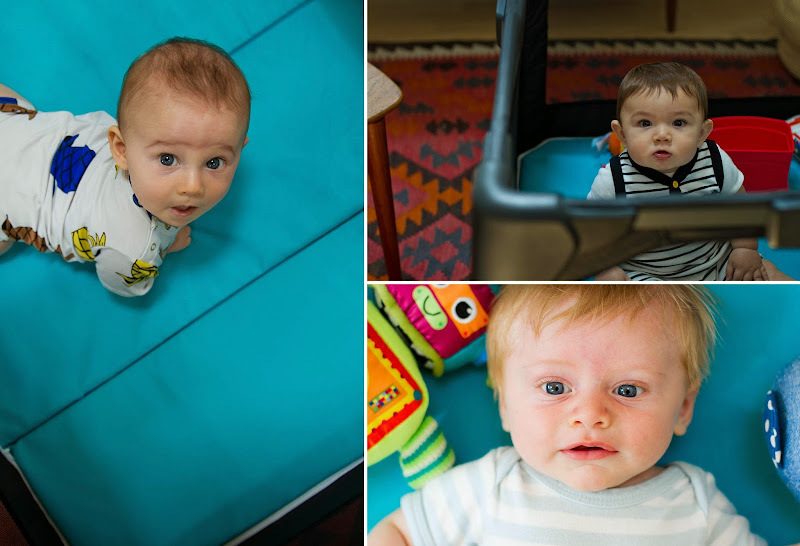 And lastly, I knew I could do almost everything ahead of time so that in the morning, while Teddy squealed and rolled around on the floor of his room, all I had left to do was cook the rice in my beloved rice cooker and slice some nectarines. 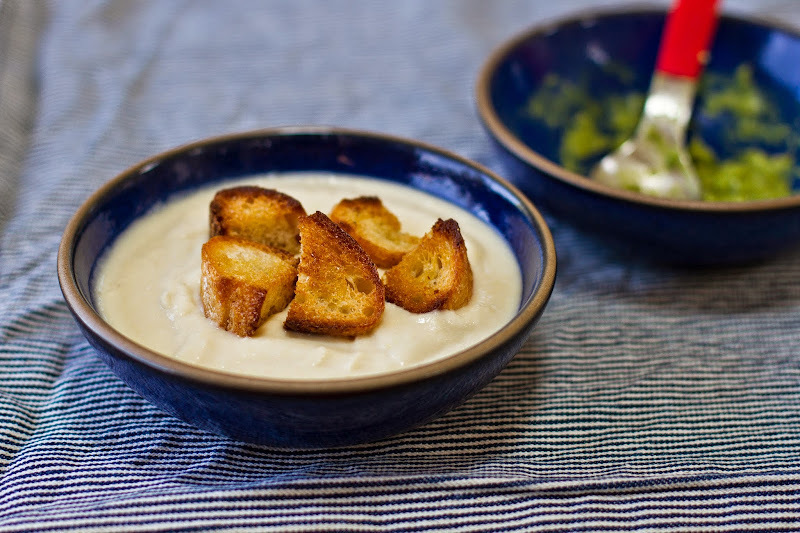 The salad was delicious—perfect for a Los Angeles summer afternoon—as was everything my fellow moms brought to accompany it, from the vichyssoise with croutons Carolyn brought, to the guacamole Rachel brought (recipe via her all-star chef brother) to the Burmese semolina cake Jodi brought. Peggy stopped by with both of her kids that week so was off the hook for also bringing food, which is another reason I love Mommune: we're flexible! In fact, I'm typing up my love for Mommune while missing today's session because Teddy decided to take an ill-timed extra long nap. 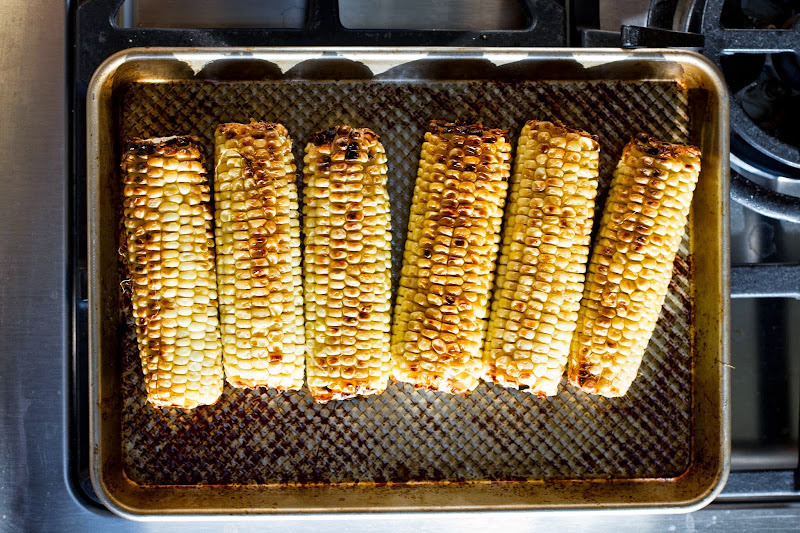 To grill the corn, lightly oil both ears of corn and place in a small baking dish. Broil about 6 inches from the heat source, turning every few minutes, until golden and blackened in spots, 10 to 15 minutes. Transfer to plate and set aside until cool enough handle. Using a large sharp knife, cut the kernels from the cob to yield about 1 cup. If you have more than this, save it for another use. Transfer the kernels to bowl and toss with pinch of salt and a squeeze of lime. Set aside. Transfer the rice to large bowl. In a blender, combine the cilantro, parsley, jalapeño, lime zest and juice, olive oil, pinch of salt, and 1 tablespoon water. Blend until smooth. Add up to 2 more tablespoons of water to thin the sauce if it's too thick. Spoon the mixture over the rice, scraping any remaining sauce out of the blender with a spatula, and mix until the rice is evenly coated. 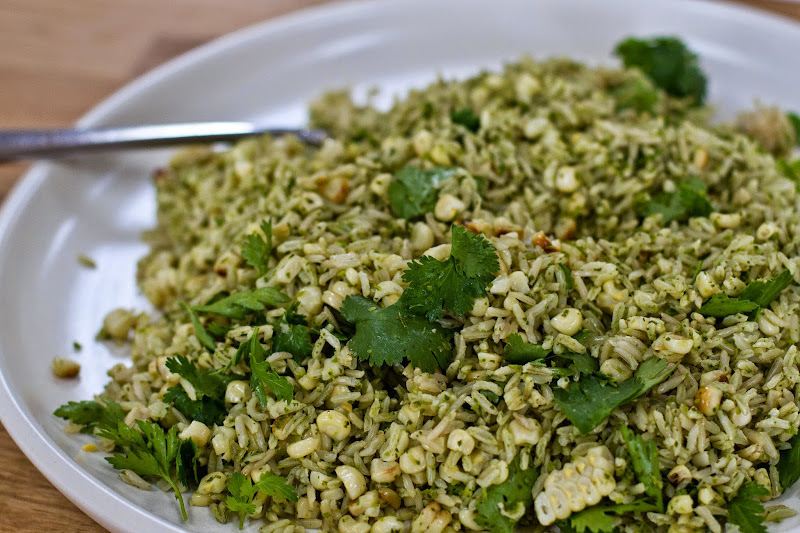 To finish, add the corn and additional parsley and cilantro to the rice. Toss to combine. Transfer the rice to a serving platter. 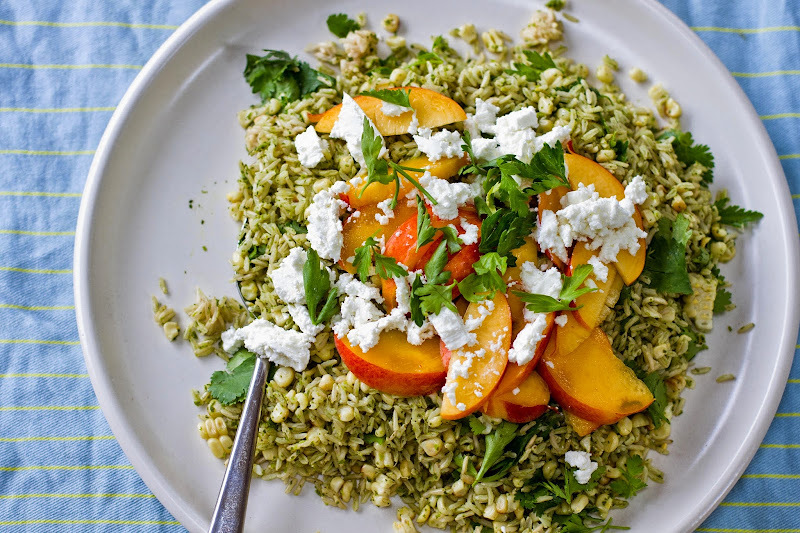 Sprinkle the nectarines and cheese over the rice in even layers. 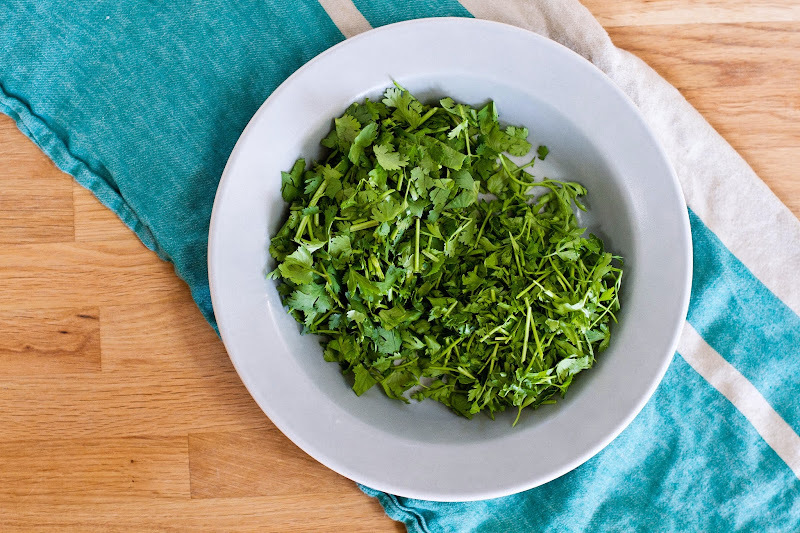 Garnish with additional parsley and cilantro. Best served immediately. 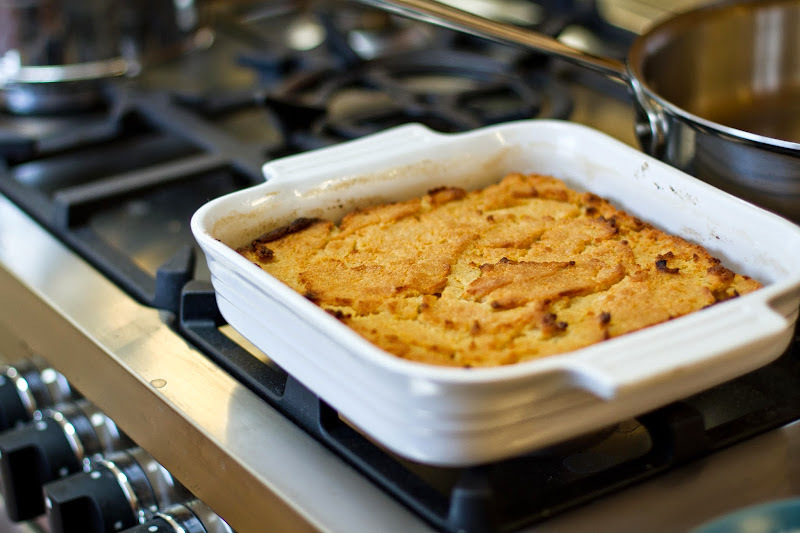 Can be made up to a day in advance; bring to room temperature before serving. The leftovers were awesome! Also, are Dad's allowed to visit Mommune? Pls advise. This looks AMAZING! So perfect for summer. Definitely going on my "to make" list! Would have loved a Mommune when Hugo was wee; in fact, would still love it! How lovely that your babies will grow up together. Mommune! Mom dates are essential to my sanity. I was home before Alice came along and enjoyed my solo gig, but like you, shortly after she arrived I needed to get out and see other people. Looking forward to trying this delicious dish. danke! I will make this for my next French picnic! It'll be a showstopper next to the predictable chips and cherry tomatoes. Happy weekend to you all, too. This salad sounds amazing! 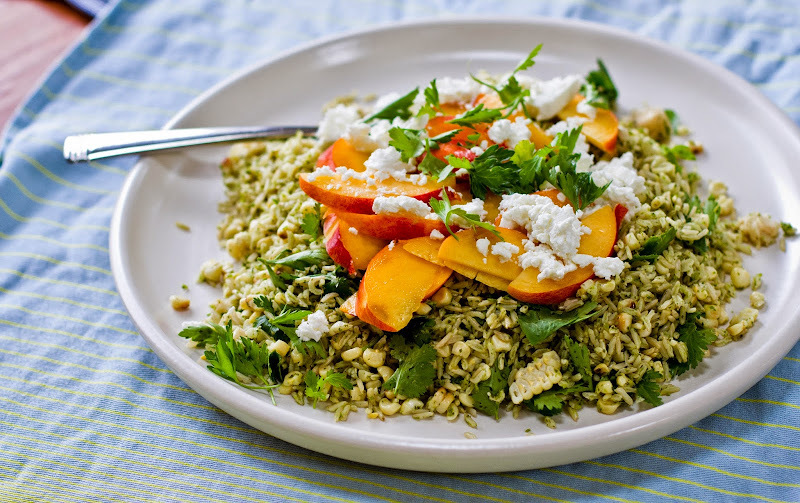 What a perfect way to eat some of the best fruit & veg of summer. Awww, happy weekend to you too, Jessie!! Looks super yummy! Beautiful photos on this post too! I was TOTALLY the same way! still love my alone time, when it is just me. But with my girls along i need to see other moms for a bit...to talk shop as you say and just feel like you're not in this crazy wonderful thing alone. Glad you have made something for yourself and the lunch component is just brilliant! Oh my, that salad looks great! And I love Mommune! Best mom group name ever. Did you triple the recipe? I see 3x the corn called for in the recipe. Turn out well? hahahaa good eye, Simone! I actually doubled the recipe, but I like corn, so I wasn't worried about having extra. And yes, delicious! Not surprising at all that you feel lonely with a baby in the house. Next step will be wanting to be with other people who don't want to discuss babies, but other things. All the while, still wanting to be with baby and other moms. It's all a bigger life.